This double sink vanity brings simple classic styling as well as great functionality to the bathroom. 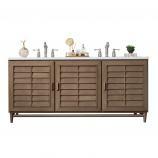 Each user has ample counter space as well as a double door cabinet under each side and a bank of drawers to be shared in the center. 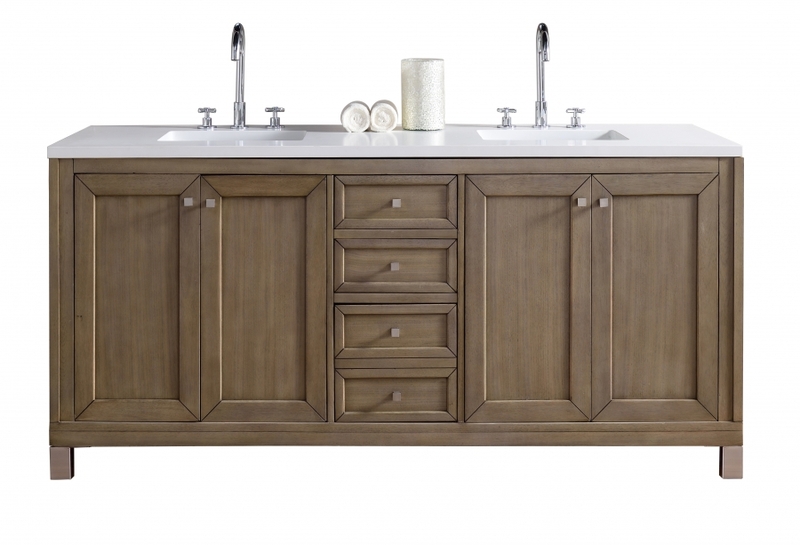 This selection has a white washed walnut finish that is enhanced by satin nickel hardware pulls that have bold geometric shapes. The base is raised from the floor with straight legs at each corner. This will make a great addition to many different types of room décor. 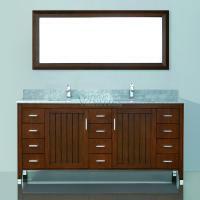 Material: This bath vanity is constructed of a combination of Acacia Solids with American Walnut. There are many uses for Acacia solid woods. Hawaiians are known for using this type of wood to make surfboards. Some also believe that it was used for Noah's Ark due to its durability to keep out moisture. All hardwoods have been Kiln dried to ensure a stable product that will not expand, contract, or warp.